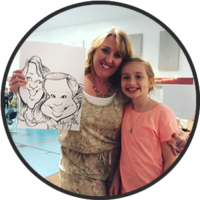 Wow your guests with the best caricaturists in St. Louis. Bax Illustration is the source that planners trust and guests love. Traditional caricatures are hand-drawn and most commonly done in B&W. Our caricaturists draw approximately 17-20 people per hour per artist. Additionally, each drawing is wrapped in a tube bag to ensure a safe trip home. Digital Caricatures are hand-drawn on tablets and displayed on large screens. After that, they are printed and even worn in lanyards. 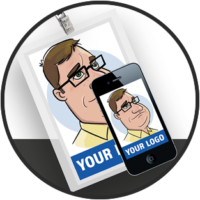 Additionally, your company logo can be featured on the drawing. 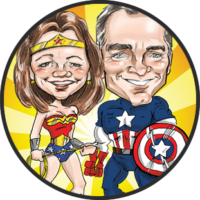 Gift caricatures are truly unique and can be personalized with a theme. For starters, you send us photos so we can draw your caricature. After that, we send you a digital copy so you can share it. Caricature proposals require a lot of coordination. Additionally, a good proposal caricature takes time to draw which is why we draw them ahead of time. 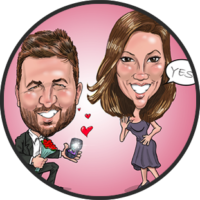 Suprise proposals are one of our favorite caricature services. Wedding Snapchat filters have never been so cool. 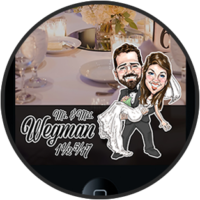 We hand draw a caricature of the bride and groom and make a filter. Check out our other wedding services.